The Brothers Gillespie are James and Sam Gillespie. They grew up in a village simply called Wall in Northumberland on the edge of what was once the Roman Empire; now part of a wide area of borderland between the River Tyne and the Firth of Forth rich in tradition and song. They play music drawn from these roots and rising from the underground cultural streams that flow into that land, old songs from the four directions and new songs. They have just released their first album together ‘Songs from the Outlands’. The nakedness of two voices riding on a flow of guitar and fiddle, seeking to uncover the heart of each song, is the key feature of the record. The songs on the record range from mainstays of the folk tradition such as ‘My Son David’ and ‘Twa Corbies’ to original compositions, one of them a setting to music of the poem ‘Devilswater’ by the now little known Hexhamshire poet Wilfrid Wilson Gibson. On the record James sings and plays fiddle, nylon string guitar and shruti box and Sam sings and plays steel string guitar, flute and mandolin. This album has come from much time listening to songs, walking with a pack and musical instruments across the land, busking on the streets of market towns and cities, and sitting down by the fire at the end of the day. The album launch concert at the Great Hall of Hexham Abbey on 11th December 2015 was a sell-out, and there are upcoming concerts touring the album in Newcastle at the Semibreve Supper Club on 26th Feb, Tarset on 27th Feb and supporting Sam Lee and friends The Fade in Time tour at their Leeds date on 12th March as well as festivals through the Summer . 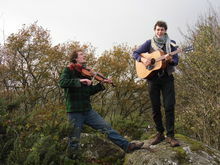 In October The Brothers Gillespie played at the Allen Valleys Folk Fest and previously at the Bellingham All Acoustic Folk Festival (BAAFest) in Northumberland.